Whether you are a football, soccer, basketball, baseball, golf or boxing fan, there is a variety of apps available for Apple, Blackberry, Windows or Android tablet and smartphone users. Sports fans have been one of the biggest beneficiaries of the proliferation of high tech mobile devices. Regardless of what sport or team you follow, there are a wide variety of apps on the market that will tell you the latest fixtures, update you on scores and results, provide you with betting odds, weather conditions, team fixtures, player stats, league tables, live sports streams and betting tips. Every week new types of sports apps hits the iTunes App Store, Google Play or Windows Phone App Store. The latest trend appears to be with social gambling apps that allow you to share your bets and challenge friends to either virtual or real money wagers. Given that there are literally thousands of sports related apps available for download from the App Store, it can be a little daunting to find the one that matches your needs. At SportsBettingApps.net our aim is to make this decision making process as easy as possible for you by providing you with informed and impartial reviews of the tops apps available today in each of these main catogeries. 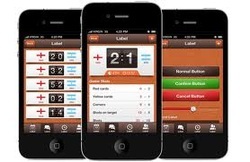 BOOKMAKER APPS - Huge advances have been made in sports betting apps over the past couple of years. What were once just scaled down mobile sites are now sophisticated apps that offer a lot more than just wagering opportunities. Mobile for instance streams over 200,000 live events every year, including NBA, football, tennis, badminton, swimming, table tennis, surfing and more. In addition, it is now possible to watch live horse racing from racecourses in the United Kingdom, Dubai, Republic of Ireland, South Africa and South American on your iOS or Droid for just a £1 wager. BETTING TIPS - Let's be honest, it can be quiet hard to beat the bookies at times. The odds are skewed in their favor so why not use some of the sports and horse racing betting apps featured on this site that offer advice from some of the top tipsters in the business. Some of the apps collate information from thousands of tipsters to give you the best chance of winning. Some of the other free apps gather together all the tips offered in leading racing publications, such as the Racing Post, The Sun, The Times, Daily Mirror, Daily Mail and a bunch of other major newspapers. LIVE STREAMING - Due to work or family commitments, it's not always possible to watch an NBA Playoff, Premier League, Golfing Major, Super Bowl, Rugby or FA Cup final game live on your television. Thankfully, there are now some free apps that will let you watch a wide variety of sports from any tablet or smartphone. VIDEOS SECTION - Even though we go to great lengths to write really informative, accurate and knowledgeable articles and reviews, sometimes seeing an app in action is the best way to judge whether it will be useful for you or not. In our videos section we've added dozen of demonstrations of the best sports apps available today for iOS, Android and more. We are looking for new and innovative ways to improve the site so we welcome your suggestions. If there are any apps that you think would be useful to sports fans, please drop us a line by using the contact form at the bottom of each page.